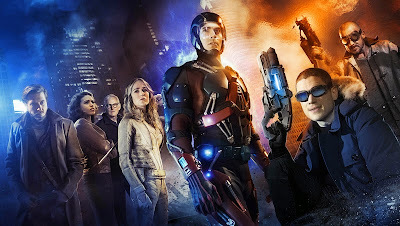 The Ace of Geeks: Legends of Tomorrow - First Look and Villain Announced! UPDATE: Now with Trailer! Legends of Tomorrow - First Look and Villain Announced! UPDATE: Now with Trailer! Excitement has been building for the newest spinoff in the Arrow/Flash universe ever since it was first announced. And now that the team-up show, Legends of Tomorrow, has gotten a mid-season premiere set, DC and the CW are starting to tease us even more. Above, you can see the first full photo of the cast, which reveals some interesting details. And today, we got our first confirmation on what villain the team would be facing. Hit the jump for all the details. In the full image, we can get a great look at the costume Caity Lotz is wearing. Caity played Sarah, the original Black Canary, on Arrow. She was killed this season, setting off a chain of events that the Arrow gang is still dealing with by this week's season finale. But here, she's dressed in an all white version of her Canary outfit, leading a lot of fans to speculate that she might be transitioning to the White Canary. Now, in the comics, the White Canary is a villain, and not related or connected to the Lance family at all. So we're guessing Sarah's back from the dead and takes on a new identity to reflect that. We'll see when the show gets started. Also interesting to note is the lack of wings on Hawkgirl, and the inclusion of Heatwave, who I don't think was announced until now. And, of course, Rip Hunter looks amazing. Today, it was also announced what villain the Legends would be facing. And it's a great one - the immortal Vandal Savage. Savage is a fantastic villain, and one that's perfect for a time traveling show - they can encounter him at all the different points of his life, leading up to the final confrontation with an immortal, unstoppable master planner. Sounds like a great idea. UPDATE: But screw all of that, because here's the first trailer and it looks AMAZING. Oh man, I love being exactly right about everything. Facebook Fan Exclusive! Sometimes the good guys aren't enough. Heroes and Villains come together on DC's Legends of Tomorrow, coming soon to The CW.